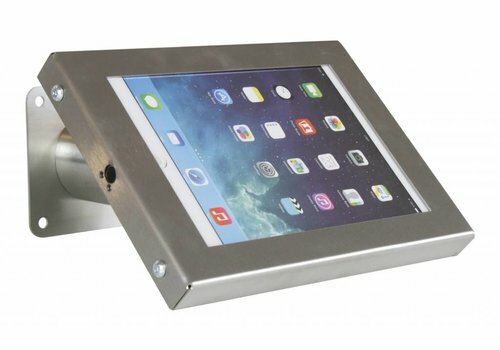 A lockable wall and table tablet kiosk for 7-8 inch mini tablets. The heavy foot plate ensures stability. 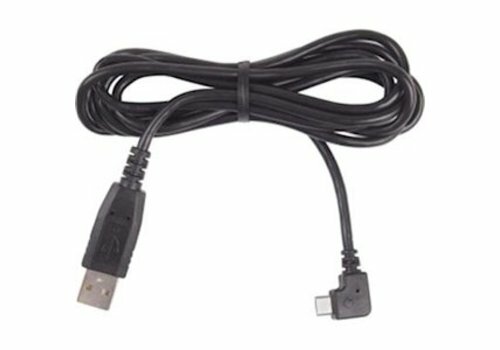 Cable management for continuous charging. Tilt option. Can be mounted to a table. 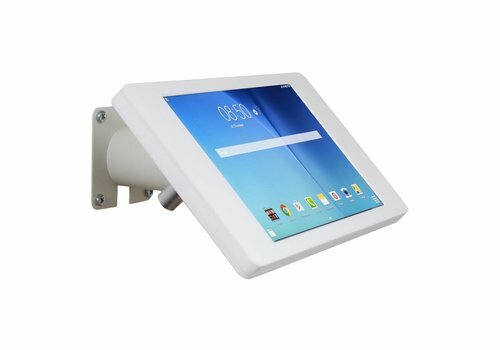 Tablet floor mount, white coated steel, 105 cm high, can be used for Apple iPads, Samsung and other 9-11 inch tablets. Lockable. 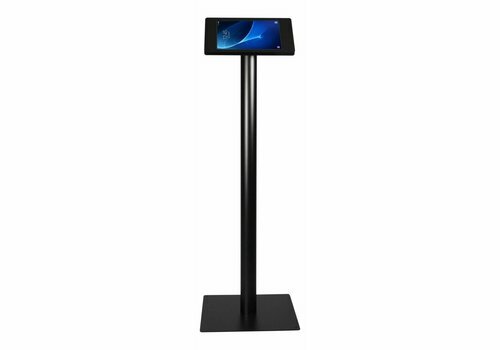 Cassette can be positioned portrait or landscape, height adjustable, tiltable. A dedicated holder for iPad Pro 11" on a 105cm pedestal. With a tight fit the Fino looks great and has an exclusive allure. The built-in push lock secures your tablet against theft whilst the tablet can be easily inserted. Display totem floor stand suitable for iPad 9.7"/iPad 10.5"/ iPad 2017 / iPad 2018. 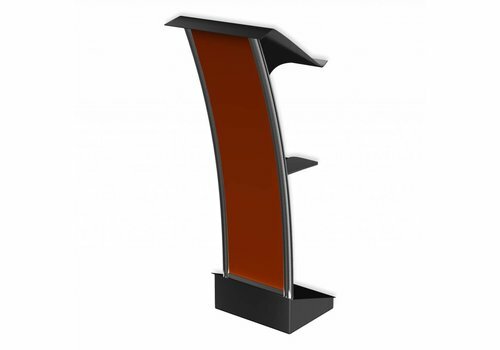 The column is manufactured from sturdy and durable steel. 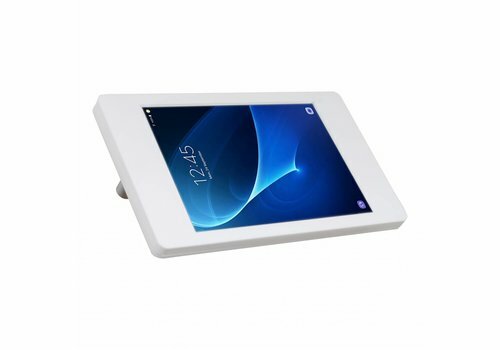 This Fino tablet display is especially developed for the Samsung Tab A 2018 10.5". Desk and wall mount. 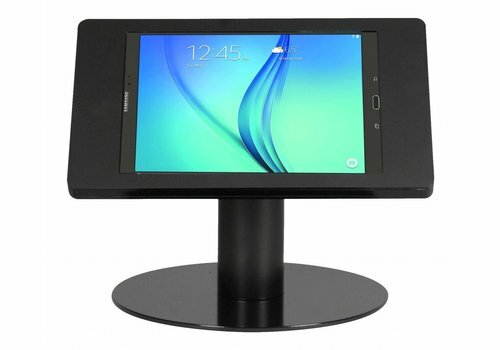 Tablet display desk stand suited for Samsung Galaxy Tab S4 10.5". The holder is closed with a lock. Power cable management. The enclosure can be positioned in portrait and landscape orientation and has no influence on WiFi or sound. 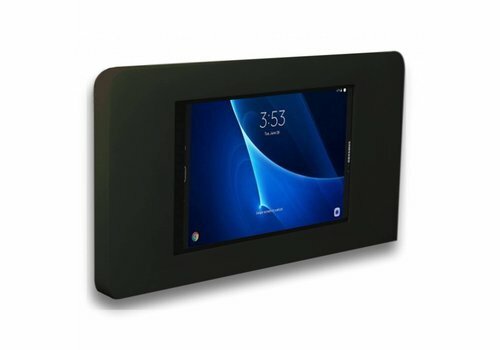 Tablet display desk stand suited for Samsung Tab A 2018 10.5". The holder is closed with a lock. Power cable management. The enclosure can be positioned in portrait and landscape orientation and has no influence on WiFi or sound. 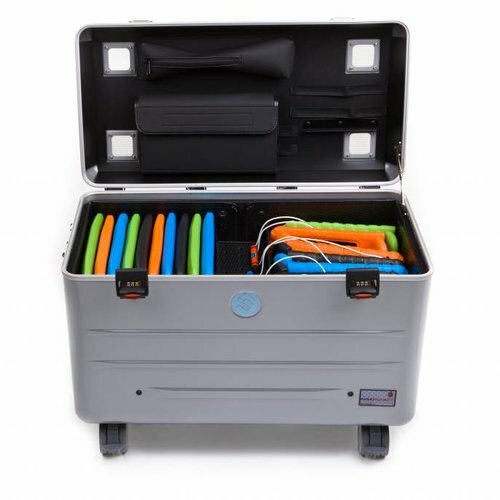 Desktop solution that lets you charge multiple iPads, tablet PCs, smartphones, digital cameras, e-readers and more. 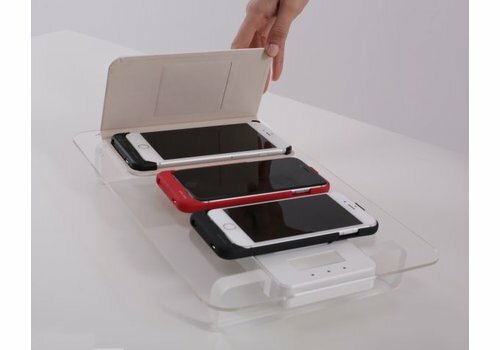 Charge and sync up to 16 devices. 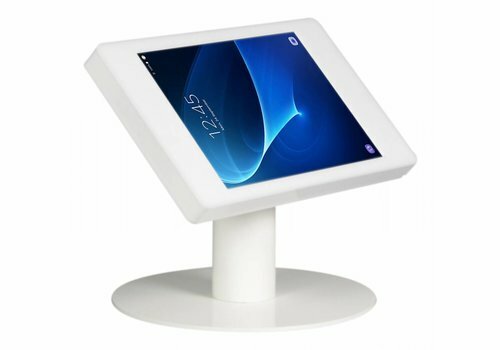 Tablet display desk stand suited for Samsung Galaxy View 18.4" tablets. The holder is closed with a lock. Power cable management. The enclosure can be positioned in portrait and landscape orientation and has no influence on WiFi or sound. 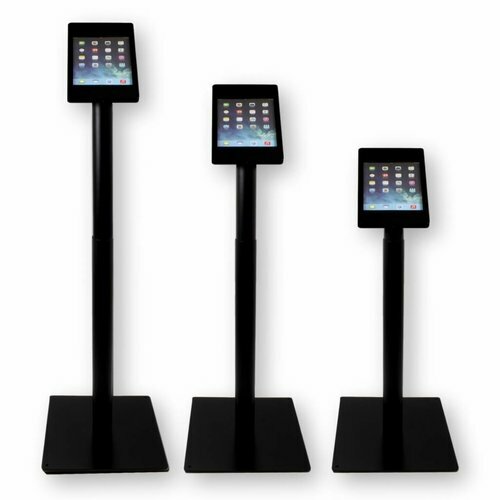 Desk stand Ferro for iPad 10.5"
Tablet stand 20 cm high, coated steel, suitable for iPads Pro 10.5". Can be locked. 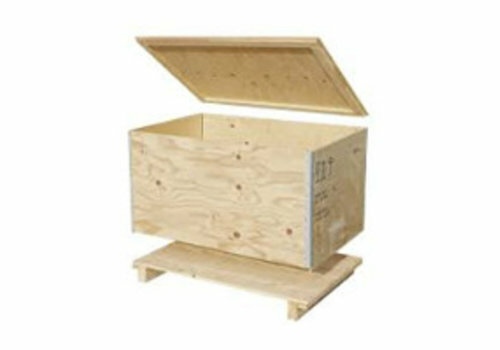 Enclosure can be positioned portrait or landscape. 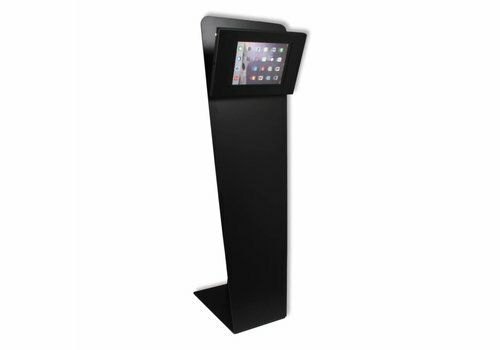 iPad kiosk 105 cm high, powder coated steel (stainless option), suitable for iPad Pro 10.5" tablets. Can be locked. Enclosure can be positioned portrait or landscape, tilt option. 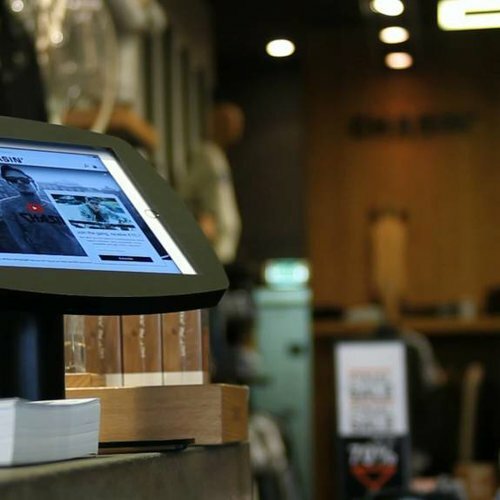 Countertop terminal for fixed points of sale. Mounting for two screens, the screens are not included. 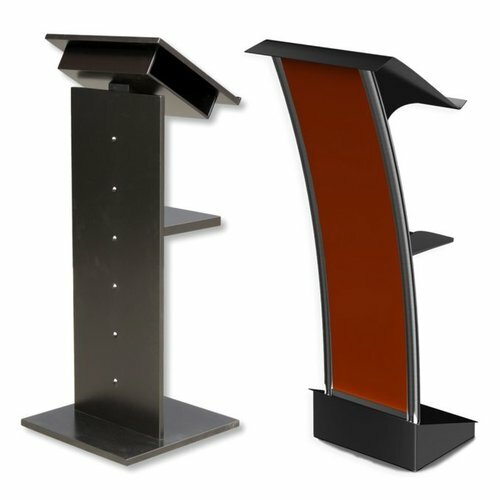 Concerto, height adjustable display furniture, not only as a rostrum but also often used in an Orchestra. 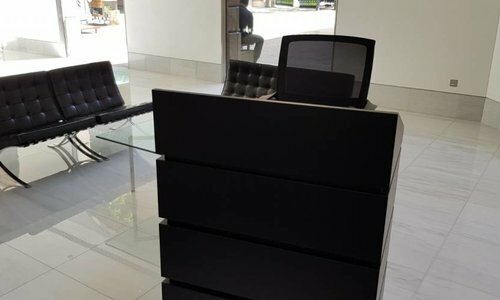 Exhibishop, display & presentation solutions! 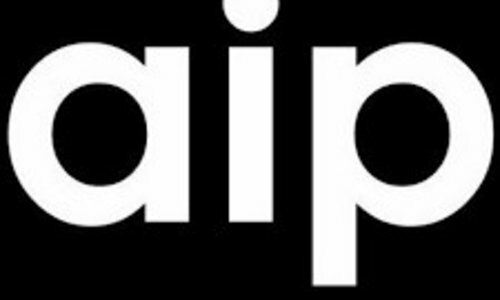 Exhibishop as a part of the Dutch company Bravour® Webshops and retailer distributor of audiovisual solutions. 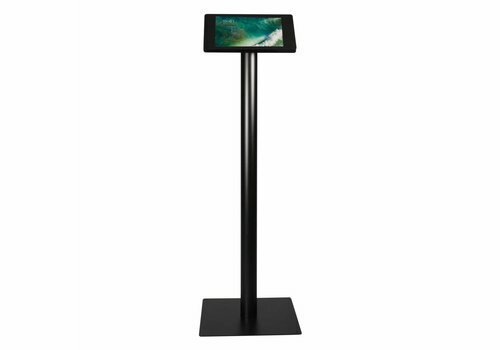 Exhibishop distributes products such as tabletstands, lecterns, multiple tablet chargers and notebook carts. 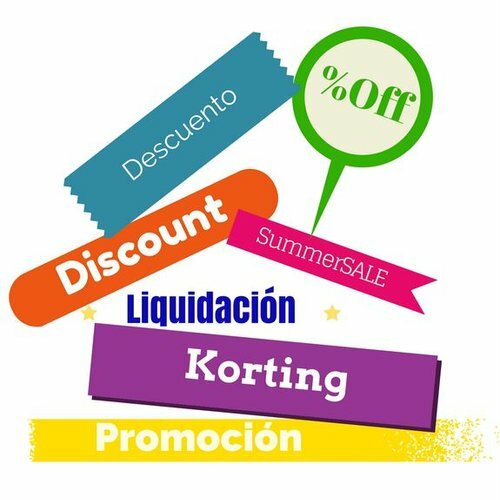 In business to business retail Bravour® Webshops offers solutions for presentations and marketing. 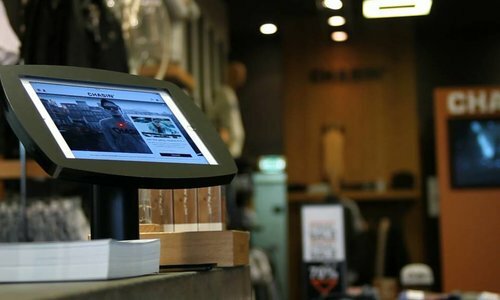 Customers are enabled to self-manage information from a tablet with great efficiency whilst your company presents itself in an optima forma! Offering a variety of supports for all makes and dimensions of tablets. They are a sophisticated and safe to make the best use of this resource alternative. 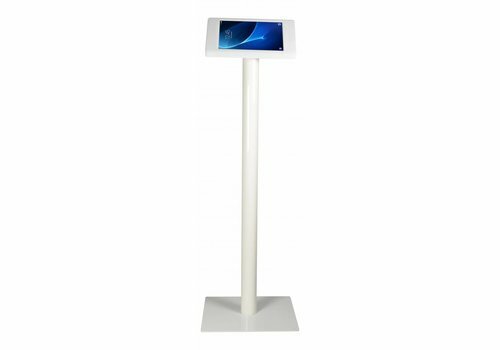 Among all the possibilities of media you can find supports to be installed on desktops, mounted on a wall or floor stands. Choose from our range of colours and materials according to their expectations. 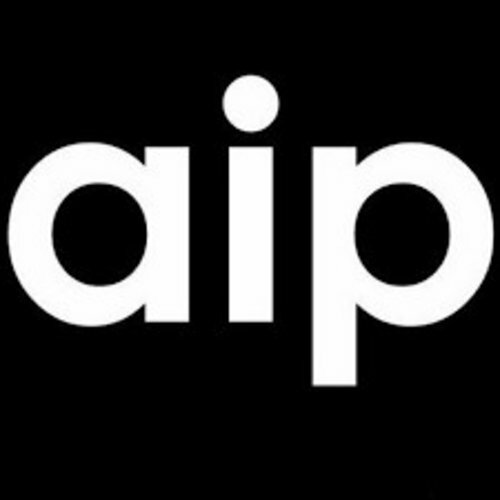 Equally as we are manufacturers we are willing to listen to your requirements and design solutions for you. Ensure flawlessness in presentations and exhibitions. 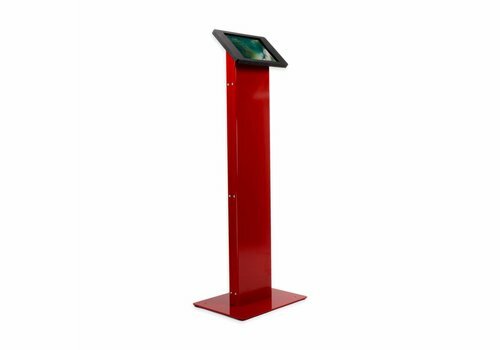 Modern design lecterns for presentations and exhibitions in public. Available materials are acrylic, wood and steel. Combined in a stylish mix are available, wood or combined. 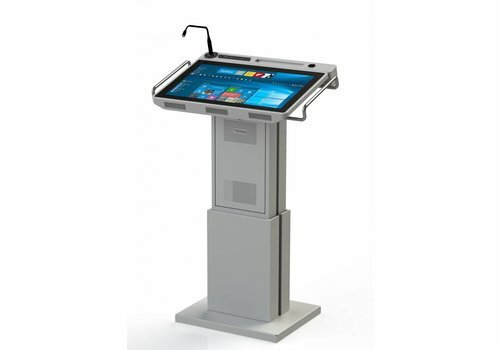 You can choose between 80 different models depending on the lectern chosen, this can be customised. You can make better use of time loading or synchronising multiple devices simultaneously This is high quality innovative solutions to conserve time and resources. They are bags and boxes with which you can upload, store, synchronise and carry multiple tablets and mobile devices simultaneously. Alike they are useful for other rechargeable devices via USB. 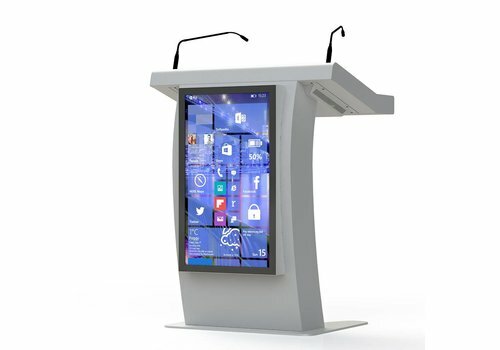 Exhibitions stands using our Bravour Tablet mounts dedicated to the Microsoft Surface tablet! 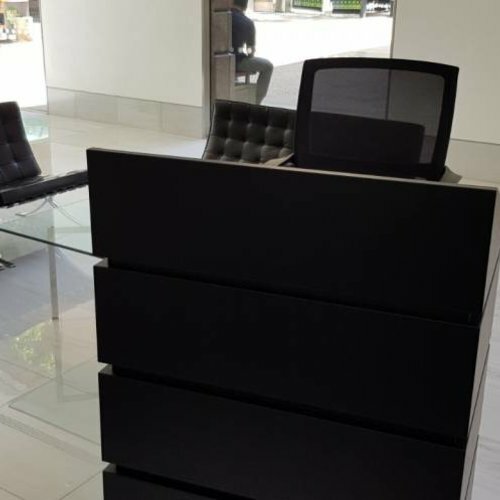 How to use a lectern creating a positive first impression.